I just woke up - hooray for sleeping pills. It's windy here but not bad, and obviously the power is on. (I've had my cell phone turned off because among the things I forgot to bring was the recharger.) If what Rob is telling me is right, about the storm surge, our apartment has probably been underwater during the night. We are safely in Bryan - a pretty long way inland, although they are expecting big winds and power outages here too. (We just made a expedition to Wal-Mart and they told the cashier while we were standing there that the store would be closed tomorrow.) The pictures of Galveston on the news are really scary-looking. The old-timers and the weather experts always say, "It's not the wind, it's the storm surge," and it sounds like that's correct this time. It's hard to relax with a hurricane breathing down your neck, as it were. We have been reading up on various storms this morning - this article (which also talks about my place of employment) mentions the 1900 storm, which a lot of people know about. 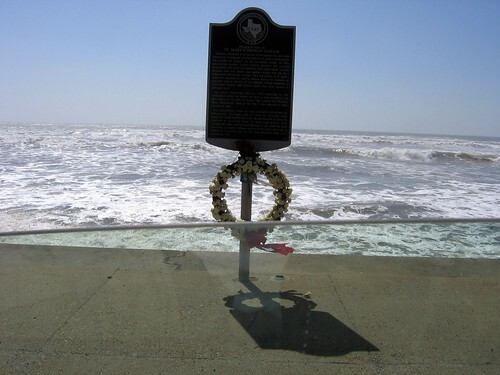 Less well-known nowadays is Hurricane Carla in 1961, a very large category 4/5 which came in at Matagorda Bay and did a lot of damage in Galveston. I knew a lot about Carla, but I didn't understand until now how very big it was. I don't actually remember it - I was a toddler - but it's part of the family lore. I may have told that story before, but if not I'll have to explain later, I don't have time now. I still have to work. Later: the new tracks seem to be shifting our way. Damn. My boss is gone to a meeting about it so we may hear something new when she gets back. In case anybody's wondering, no, we are not evacuating. Nobody in Galveston is, apparently - we just went out and it was very much business as usual, tourists and all. The hurricane watch actually ends at High Island, which is maybe 25 miles east of us. That's not to say we're in the clear, because if you look at all those maps we're still in the "cone of uncertainty" - but we're at the very edge of it so we're just in wait and see mode. And crossing our fingers for everybody in New Orleans. I've had an ambien and I am hoping I will be able to go to sleep in a while, and then conceivably get my sleep back on schedule. Cross your fingers. This may well be a sort of "bits and pieces" entry, since my mind is going off in a bunch of different directions, as usual. Oh, and when I read back over what I wrote in the last entry, it reminded me that my 6-year-old cousin Laci really did not know what to make of the box of ashes yesterday. She has presumably been indoctrinated into some varation on evangelical christianity, and I know at least some of those types think that you have to preserve your body after death, because you'll get your same earthly body back when you go to heaven. (Which personally I think is a really appalling idea. Yuck.) Anyway, from the questions Laci was asking, it sounded like maybe she had been told some version of this story. Her mother had to explain to her that Aunt Billie Dell wasn't in that body anyway, she was in heaven and she had a whole new body which wasn't sick any more. Stephanie (the mom) also said later that she figured that my mom and my grandmother were up in heaven watching us and laughing. All I know is, if they were watching, she would be right. They would totally be laughing. Both my mother and grandmother had a fine sense of the ridiculous. I don't want to go to work tomorrow. I want a day to recover from the weekend, dammit. But I guess I'd better go to bed, since I'm not getting it. My sister's moving to Austin next week. (Along with her family. There's been some marital friction there of late, so that's not completely a foregone conclusion.) Good, maybe I'll get to go visit once in a while. Ever since they moved to Conroe a couple of years ago I've hardly seen them at all, anyway. I'll hardly know the difference. And that reminds me that I've sort of been meaning to write a journal entry about my sister and our relationship. I need to get around to doing that. But not tonight. Well, since I keep writing about the weather lately, and it is hurricane season and all, I will keep going, and tell you that we had even higher tides today. They were talking about flooding on Bolivar and down at Jamaica Beach, and they kept saying that it had to do with a strong east wind that was blowing all the water across from Florida. (All the water?) Well, then finally this afternoon they said that that strong east wind had also blown the remnants of Ivan back across the Gulf, and it was somewhere south of New Orleans, and threatening to form back up. And guess what direction it's going? No TV trucks out there today. (Lotsa surfers again, though.) 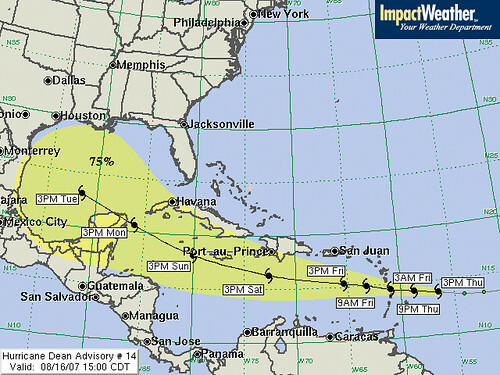 But if that thing really does become a tropical storm again, those trucks will be back by tomorrow. I explained my theory of weather forecasting by TV trucks last week (see September 15), so I will tell you that there was one out there today, only I really haven't figured out why. There was something weird going on today, though; I got an e-mail with a Coastal Flood Warning. Apparently, for reasons I don't quite understand, the tides are a couple of feet higher than normal. But would they really send a truck down from Houston for high tides?